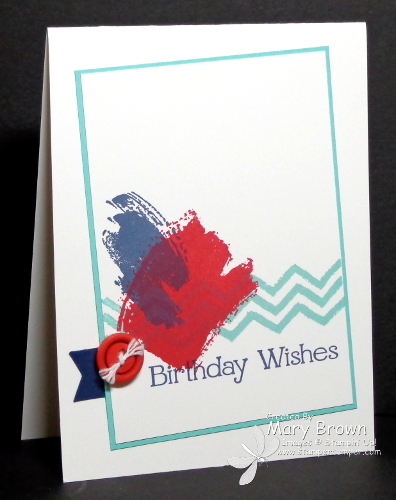 I just love the colors in the Maritime dsp – Real Red, Coastal Cabana and Night of Navy. For that workshop in May, like I said in my other posts we made 4 easy cards. I decided to show off a new set (and of course I used my VERY FAVORITE new set – Work of ART) and when I was trying to figure out some cool colors to use, I decided it would be fun to used the colors in the Maritime dsp. Just a note…the Real Red button on this is a retired one. I didn’t have enough of the new buttons to use for all the make and times. The new ones will work great too! Whisper White – 3 1/4 x 4 1/2. Stamp chevron using Coastal Cabana, larger swoosh using Real Red and small swoosh using Night of Navy. Layer onto Coastal Cabana 3 3/8 x 4 5/8. Punch out Night of Navy Bitty Banner and add to pack of panel then add panel to card front. Tie white Baker’s Twine into Real Red button and add to card front using glue dot. Yep…it’s another quick and easy card! This entry was posted in Clean and Simple (CAS), Make and Take and tagged Four You, Work of Art. Bookmark the permalink.